As a bonus, these instructions also show you how to string several of these 1-Skewer kites together in a kite train! There's a 2-kite train up there in the photo. This design is so cheap and easy, why not try an even longer train. Imagine 10 or more, all flying on the one line! 1-Skewer kites are fun, but somewhat toy-like :-) due to their rather small size. Fancy something much bigger to fly, suitable for teenagers and adults? The has plenty of 58cm (23") designs in bamboo skewers and plastic. These are 2-Skewer kites, but all the 1-Skewer designs are in there as well. A handy approach is to just print out the pages for the kite you want to make next. The e-book is also handy for working off-line on a laptop, tablet or other device. 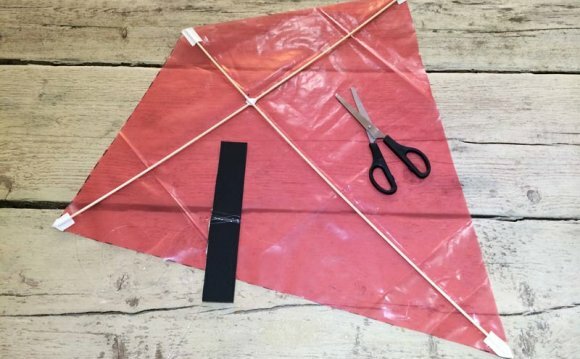 Now's the time to read up on the required for making a Skewer kite, if you haven't already.